OK, seriously? 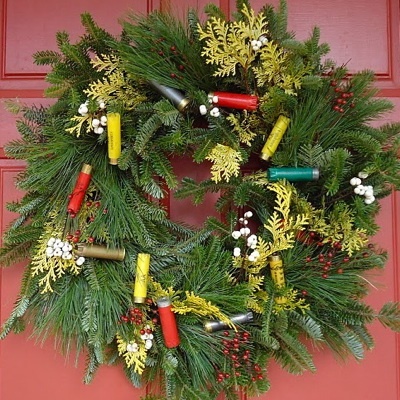 A shotgun shell wreath? Really? REALLY?? I’m all up on the holiday decor thing and each to their own, but honest to God this is beyond me. Who in their right mind is going to put this up? And who is going to buy it except as a not-funny gift? The guys who don’t just snort the first time they trigger Big Mouth Billy Bass at Walgreens but think he’s a hilarious present? You know what I’m thankful for this Thanksgiving weekend? That I don’t know anyone who would give me this wreath. Oh wait – I just read the full description: “Chamaecyparis, rose hips, and Pheasant Feathers (feathers not pictured in this wreath, but we will update the photo soon! )” Ah. I see why I hate it: it’s because the feathers aren’t in the picture. If it had feathers, it would be 100% awesome. I think a shotgun shell wreath is hilarious! With or without feathers it’s funny!